Most of us chicken keepers are keen to give our birds what they really, really want. I love their total enthusiasm for kicking aside the leaves and rapidly diving in, beak first, to peck up whatever little insect or spider was hiding underneath. They'll do it again and again and again. Life's sad for a chicken with nothing on the ground to scratch and peck at. At heart they're still junglefowl, so when you're creating an environment for your birds, think about what it's like at the edges of jungles (junglefowl hang out at jungle edges, not in the deep dark depths). Think piles of leaves, preferably with the deepest levels starting to decompose to feed a wealth of insects underneath. If your birds are free-range, they'll find their own favourite places in your garden to scratch and peck. Anyone who's mulched their garden and been thrilled that it now looks like a bought one will testify to this: give the chooks 10 minutes in the garden and they'll kick aside that pretty mulch. 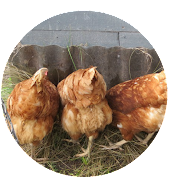 If your chickens are contained in a run, it can be hard work to maintain the ground to their liking. Whenever you weed the garden or sweep leaves or produce almost any vegetative matter, chuck it in their run! Throw them some spadefuls of compost. At the very least, dig over the soil in the coop to loosen it for them so they can move that around - it gets compacted quickly, especially in rainy weather, and then becomes useless for them to scratch at. Notice in the video above how the ground level is raised. This was not intentional - it's just a result of years of throwing organic matter in there! Together with our chickens we have created a mound of goodness.